Many of you know I am a caregiver for my hubby. He was always a robust, strong man who loved the outdoors, caring for flower gardens, building things with his hands... He loves people. Loves to talk. Never meets a stranger. He is my forever love. So caring for him is not a chore, but a blessing. One of our dear neighbors several years ago wanted a bookshelf for her daughter in the shape of a house. She had priced them and they were out of her range. 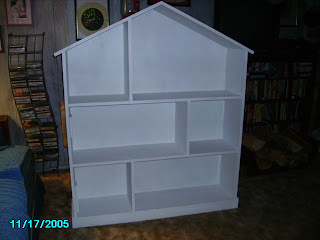 So my hubby got busy and built this for her. 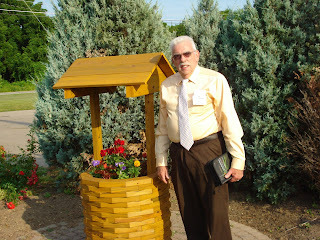 This next picture was taken at our church in the prayer garden. He built this wishing well as a memorial to a beloved friend who died unexpectedly. When our prayer group decided to do something to honor this man, my husband spoke up and volunteered to do this. This was the last thing he built before he became too ill to follow his passion any longer. There are days when I am torn about my writing and whether I should continue pressing forward with it. 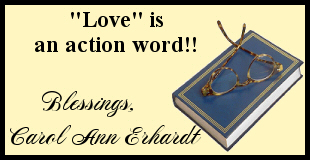 My passion has become taking care of my beloved husband, so my writing passion has moved further down the chain. But writing is still a passion, for whatever meager talent I have has been God-given. God makes changes in our lives. We may not always understand them, but we have faith to sustain us. The faith that He has a plan for us, and that plan is not to harm us. Proverbs 16:3 is what keeps me strong in doing the work the Lord hands me. "Commit to the Lord whatever you do, and your plans will succeed." May your paths be made clear and may you commit all to the Lord and be blessed. May God pour down his blessings on you and your hubby, Carol Ann. Praying for your continued strength and endurance as you care for your beloved. Love and hugs, my friend. Thinking of you Carol Ann and thankful for each day you have to share with your dear man. Thank you Dora and Sharon. Each day is a blessing. Carol Ann, you are an inspiration to me. I love your devotions. They speak to my heart and encourage me to be a better person. Thanks for sharing memories and events from your heart to ours. How sweet of you to say, Caroline.